Most model railroaders are aware of the need for clean track to keep your trains running. Stalling & lurching locomotives can be one of the most frustrating aspects of the hobby, particularly with today’s digital sound-equipped locomotives. One factor in smooth running that is often forgotten about is cleaning locomotive wheels. Having pristine track is not going to help if your locomotive is running on ‘tires’ of dirt and grime that are preventing the electricity and DCC signal from reaching the decoder and motor. The fact that most European models in N and HO come equipped with rubber traction tires on some driving wheels means keeping the remaining pickup wheels clean is doubly important. The best tool we have found for cleaning locomotive wheels is the TRIX wheel cleaner brush. 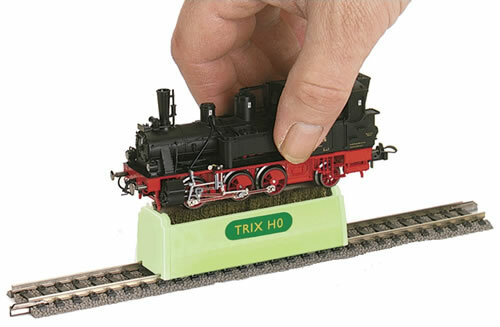 Available in N scale and HO (not for Marklin AC, sorry), the Trix wheel cleaner is compact to store and does not need any messy fluids or disposable cleaning pads. Simply place the wheel cleaner on your track and track power is transferred to a pair of narrow ‘brushes’ (made of soft brass wire). Holding your locomotive pickup/driving wheels gently on the brushes while the power is applied and wheels are turning will gently scrub the grime from the surface of the wheels. The flexible bristles of the brushes are very effective at making sure the entire wheel surface is clean, something that can be difficult to achieve with hand cleaning or other tools. For longer or fragile, hard to hold locomotives, multiple cleaners can be easily be connected together to create one longer wheel cleaner. 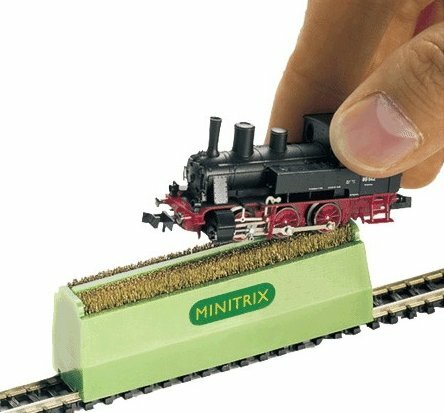 You can buy the Trix 66602 HO and Minitrix 66623 N scale wheel cleaners on our store’s main web site. Add one to you next order!